It turns out today has been super productive. Alongside the usual jobs associated with caring for a 1 year old, I have been swimming, had a trip into Cambridge, done some bread baking and have done lots of crafting! The crafting was inspired by this mornings exciting delivery from the 'The Eternal Maker'. I had ordered all the components needed for lampshade making and a selection of beautiful fabrics. The fabric I used for the lampshade (pictured above on a charity shop find lamp base) is a japanese fabric: peck stripe faded pink & aqua - echino fall 2011 fabric by etsuko furuya. It is a lovely slightly chunky weave and the colours are intense and bright. I would also like to highly recommend The Eternal Maker's Internet shop and service, my products arrived in under 3 days and were perfect. I used to frequently visit their gorgeous Chichester shop during my lunch breaks from the gallery and I was always tempted to buy something (and sometimes lots of things). I sadly now live too far away to visit (Tom however is very thankful for this!) but i will definitely be shopping online with them again soon. 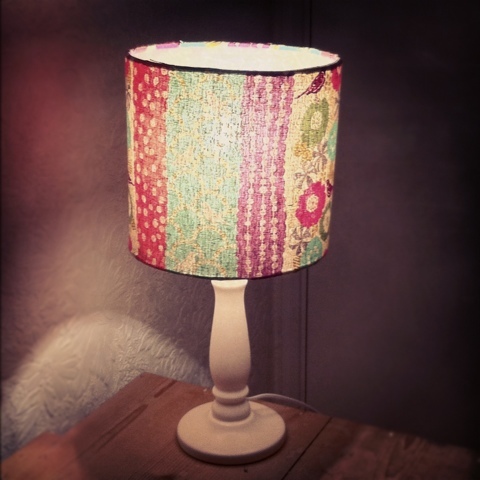 I loved making the lampshade and may try out a few more designs. Looking great and impressive lampshade which could be admirable by the handmade making. Thanks for the sharing.